Case classifications let you store demographic information about the 'units of analysis' in your project. For example, you could create cases for your interview participants, assign these cases to a classification called Person, and record values for Age, Gender, Level of Education and Occupation. 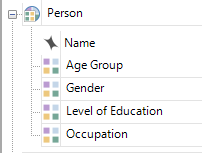 Before you can setup the demographic data for your cases, you need to add one or more classifications to your project. How many case classifications do I need? You can create whatever classifications you need to support your analysis. Your project may involve comparing organizations, sites, places or other types of cases. You can create classifications to support the comparisons you want to make. On the Create tab, in the Classifications group, click Case Classification. Select Add one or more predefined classifications to the project. Select the check boxes for classifications you want to add. In Navigation View, right-click on Case Classifications, and then click New Classification. Enter the name of the classification—for example, Participant, Place or Site. In List View, right-click on the new classification and click New Attribute. Enter a name for the attribute. For example Age, Gender or Occupation. For Type, select the data type of the attribute values. For example. Age is an Integer and Gender is Text. Click the Values tab (at the top of the dialog) and click Add to create each attribute value. You can also add the values later in List View or in the classification sheet. You can now assign cases to the new classification and define the attribute values for each case.